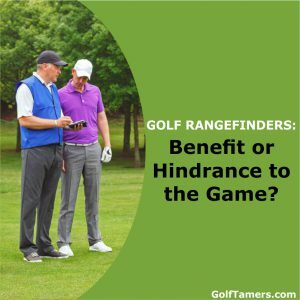 Golf Rangefinders: Benefit or Hindrance to the Game? Home » Guides » Golf Rangefinders: Are They a Benefit or Hindrance to the Game? Golf rangefinders, whether GPS or laser, are changing the way players interact with their environment and helps to improve game play while on the course, professionally or leisurely. You may use one, you may not – yet. And, depending on your personal opinion, rangefinders could be a good thing or a hindrance to the game. Where do you fall on this scale? Do you you already take advantage of the many benefits of golf rangefinders? It’s hard to say “no” to a convenient device that makes getting the distance you need fast and accurately. In fact, a poll done in 2012 revealed that about 69 percent of golf players that participated in the poll use a rangefinder. The other 31 percent… don’t. Because of the many benefits golf rangefinders offer, you’d think that every golf player would be pro rangefinder, but it just doesn’t always work out that way. If you’re a traditionalist and you much prefer the go-with-your-gut or ask-the-caddie method, you’re probably not going to embrace the rangefinder as readily as someone else. Heck, you probably have a thing about golf carts too! Well, I’m not going to hold it against you as long as you take a second to see if rangefinders have earned their place in the golf game or not. They’re convenient to have, carry around, and to use. You can take them with you anywhere on the course. They speed up game play. They can even be wearable. You don’t have to consult a yardage book or depend heavily on yardage markers. You can use the right club to attain the best ball trajectory based on the distance. You can avoid hazards based on the accurate distance. 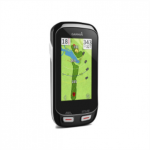 You can get out of blind spots easier with GPS rangefinders. You can know the distance to any target or landmark, not just the flagstick, on any point on the green and the course as a whole. On a clear, early morning, you’ve put your golf shoes on at your favorite club and you’re ready to hit the course. With cell phone on silent and tucked away, you and your buddy head out on foot to enjoy the comfortable pace of a leisurely game. There’s something therapeutic about “feeling” the distance or walking the extra 20 paces to walk off yardage. You might even be toting around a yardage book, lugging your golf bag behind you, and hitting the course the old-fashioned way – on foot. When you see those small trees in the 150 yard distance, you probably even sport a frown. But, you flip those sun-glasses down, peer at the yardage markers on sprinkler heads, estimate your distance, choose your club and ball correctly, and you enjoy every part of that 3:1 swing ratio. Now, that’s a golf game worth getting up early for. This is as old-school and enjoyable as it gets. And there’s no reason a rangefinder should negatively impact this scenario. If anything, they help to enhance enjoyment and game play. But, I hear you and I hear your complaints. So let’s explore them. “GPS rangefinders are distracting and interrupt my game play”. This complaint can be due to the fact that there are some with wi-fi and bluetooth capabilities that can stay connected to certain Apple iphone models so that you never miss a text, call, calendar alert, or email again. You could argue that the golf course is the sanctuary to escape these things and the stresses of the world outside the green. But, again, these features are so convenient and handy that being “connected” while you’re on the tenth hole could mean the difference between getting to that meeting on time or making it home for dinner with the family. Besides, you can turn this feature off if you don’t like it. You can even turn down the volume on the audio tone alerts so that it’s not distracting to yourself or to others. “No one walks off yardage anymore to check distances or even walks at all, thanks to golf carts and rangefinders”. This complaint might come from someone who has the luxury of spending the next five hours dedicated to a nice, slow round. 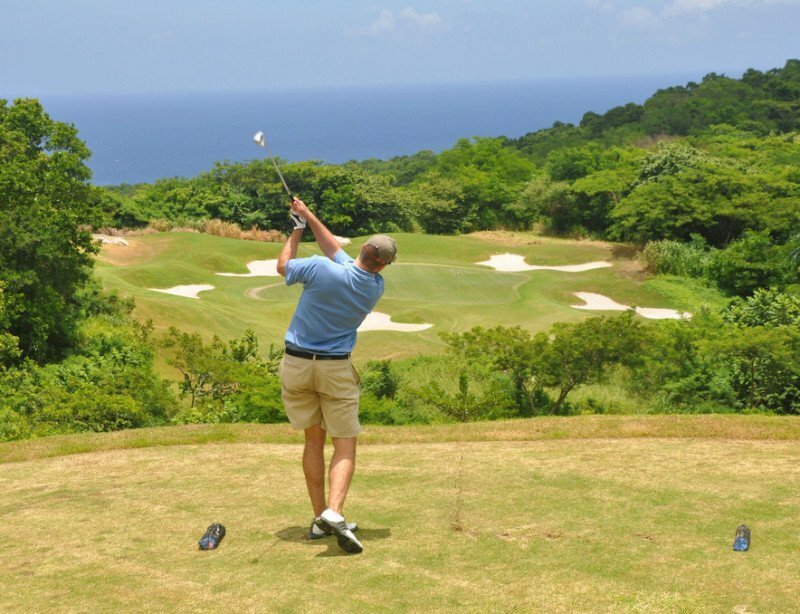 But, when a typical golf game can last anywhere from three to six hours, there’s no doubt that one round is undoubtedly time-consuming. If rangefinders and golf carts enable faster game play without taking from the essence of the game, and they allow people to enjoy a good round to have fun and unwind in the limited amount of time they have, there’s really no downside to using them at all. “Rangefinders are a cheat way to avoid lessons, practice, and skill”. You could argue that this complaint has some valid points, to an extent. Certain apps on GPS golf rangefinders are capable of training you to reach a perfect 3:1 swing ratio while laser rangefinders can take out all the guessing work to give you a precise distance. Both kinds can give you an angle adjusted distance and even suggest what clubs you should use. This can be seen as a the “fast” way to getting good at golf, where you might argue that you’re not really getting good at all. If you were to take the fancy gadgets away, could you still get a par in one? This complaint is really an insecurity about change and how rangefinders are appealing to players of all sorts of skill levels and their many different purposes for playing. In this case, in what way does a rangefinder differ from a professional caddie carrying a calculator and yardage book or a tutor? There isn’t any difference. Should all golf players be invested in lessons and playing with adept skill? No. You play golf because you love it, whether you’re a pro or an amateur. “Rangefinders make people obsessed about the numbers”. Okay, I can see how this complaint can be valid. How disappointed your buddy could be by hitting 65 yards when his rangefinder said 70 yards. Even though he got well within the green, and he should be happy about that, he’s still hung up on the numbers and disappointed that he didn’t hit perfectly. Great time to watch him throw that expensive gadget into the nearby water hazard, right? Well, on the bright side, by knowing the exact distance, you can make your next shot just that little bit better. Improvement upon improvement should have you swinging better and better with time. You’ll get a feel for how hard you should hit, what club to use, and even how that wind affects your shot. If you’re all about intuitiveness, a rangefinder can help hone that distance-estimating gut-feeling. “Rangefinders have too many features which slows down game play because the user is too busy “fiddling”, having to use every app/feature on every shot”. I can see how this can be frustrating, especially when you’re waiting for your buddy to take his turn. You patiently wait while you watch him fiddle-faddle with whatever it is he’s doing on his smart-phone look-alike rangefinder. This is a common complaint that many golfers have about rangefinder users. Funnily enough, it’s also a complaint that many rangefinder users have themselves. Why? 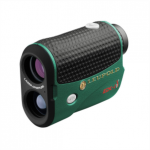 Sometimes, rangefinders can be equipped with so many features, especially those of the GPS kind, that seem to take more interaction from the user than actually playing the game of golf itself. Having to remember to set the timer, look up the distance, and activate the shot distance calculator can seem like eons while you’re anxiously standing there waiting. But, in the long run, the time it takes to use the rangefinders, whether it’s a GPS or laser device, should still be shorter than walking off the distance or checking and peering for markers. Also, you can get a basic, straight-to-it rangefinder that just gets you that distance to the hole. It’s true. Rangefinders have changed the way golfers play the course. Is that really a bad thing? It hasn’t changed the essence of the game, nor the game itself. If it helps you to enjoy a round and have more fun while playing, then there is no downside. You could say they’ve replaced caddies, walking off distance, possibly have made lessons null, and may even have unsanctified the course with bringing in advanced ways to stay connected to your phone. But, you can’t deny that there isn’t a better or more accurate way to get that distance to the hole than with a rangefinder. Or that there aren’t many other benefits of golf rangefinders to boot. You’re not giving up on the quality of your game by using one, you’re improving your game by using one. So, again, where do you fall on the scale? Pro-rangefinder or anti? I should probably disclose that you don’t get a vote if you haven’t tried one. I promise you’ll be a convert if you let your stubborn, little mitts get a feel for the convenient, time-saving, and accurate little devices.